Appearing for the Nigerian government on Wednesday 14th November 2018, were the prosecuting counsels led by Labaran Shaibu. His colleagues were C.S. Nnanna, Y.A. Hope, Abubakar Musa and Collins Enemoseler, as introduced. The counsel representing the first surety introduced himself as Barrister Chukwuma. Barrister Aloy Ejimakor was introduced as the counsel representing the third surety amongst others. Barrister Labaran Shaibu, the leading prosecuting counsel called on the attention of the presiding judge, Justice Binta Nyako, to a pending aspect of the case, thus: "My lord, the matter as previously adjourned for today is meant for the three sureties to show the court reasons why their bail bonds should or should not be forfeited. And for the records my lord, this process started since 10th October 2017. We demanded that an order be served on the sureties and in compliance with that, the said order was duly served. Returning back to the court afterwards as scheduled, the proceedings were obstructed by my honorable friend, Barrister Ifeanyi Ejiofor. The leading defense counsel, Barrister Ifeanyi Ejiofor immediately raised an objection to the submission and demanded that Labaran Shaibu, make a withdrawal of his choice of words on "Obstruction of proceedings". To this Labaran apologized and immediately withdrew. Continuing, he stated: "My lord, I want the sureties to tell this honorable court, why they should not forfeit their one hundred million naira (N100,000,000) bail bonds each. The business of the court today is for the sureties to show cause why their bail bonds should not be forfeited. So I am not interested in what Barrister Ifeanyi Ejiofor has to say but rather, the representing counsels of the sureties. Barrister Umeh and other counsels to the sureties, "why are your clients not in court? Barrister Umeh: "My lordship, my client attended to a function and that is why he is unavoidably not absent in court. Justice Binta Nyako: "I will make my order clear on this, it is not a threat. The sureties have failed to provide the first defendant (Nnamdi Kanu) in court. I have discovered that he is not with the Nigerian army and you have failed on your own part to produce him as demanded. You cannot be taken out of suretyship. You have only two options: produce him or you forfeit the bail conditions". Continuing, the presiding judge stated: "Barrister Umeh, I have found out that you and your clients are taking this court for a ride. And I hereby serve a bench warrant for the arrest of these sureties unless they strive to be in this court this morning. You were asked to produce them in the last sitting but you came again today without them. I can recall that the sureties made undertaking to be in this court as often as when needed". Surety counsel: "My lord, before you take such a decision, you have to put into cognisance, the events surrounding the reason behind the defendant's absence in the court. Justice Binta Nyako: "Before you take anyone on bail, you must consider if you can really vouch for him or her. It is not the business of the court to know what is hindering your client from appearing in court". Surety counsel: "Your lordship, the court demanded that one of the sureties must be a Senator and he has duties of national interest to attend to. He has been regular in previous sittings but could not show up today as a result of his responsibility to the citizens. My lord, I pray that you stay action on the bench warrant as threatened". Justice Binta Nyako: "I have granted your request. There is therefore, no bench warrant". Barrister Umeh: "Thank you my lord!There is this information making the rounds, that Mazi Nnamdi Kanu resurfaced in Israel. 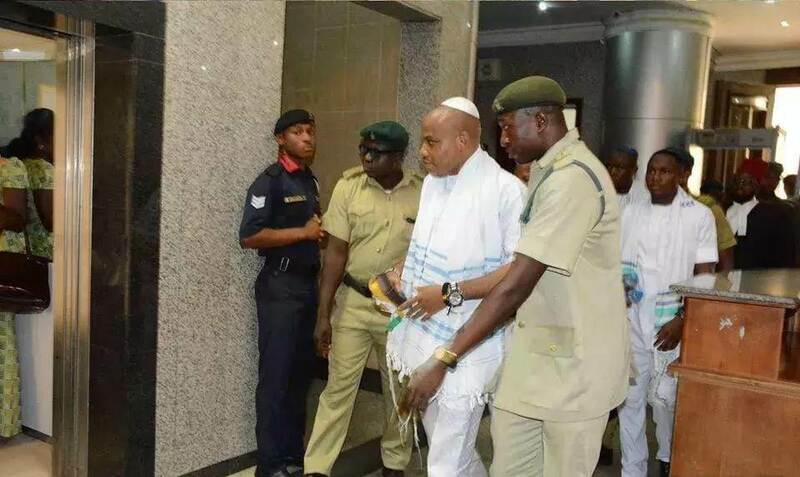 In order to be sure that this court is not misled, we have filled a motion for stay of action and had written to the Israeli embassy, to ascertain if truly Nnamdi Kanu did appear in Israel". Justice Binta Nyako: "I want you all, to produce MY NNAMDI KANU". "I will not order for the sureties bench warrant, but they must have to forfeit their bail bonds". Barrister Umeh: "My lord, if my client is forced to forfeit the bail bond, it therefore suggests that the court has already given conclusion on the matter without hearing from them (sureties). Your lordship, if you give such a ruling, you will indirectly be sending a wrong signal to the world. There is another matter in court 2, which is placing a demand for same and if you take such a decision, it then will definitely send a very wrong signal. Your lordship, you will have to hear the reason why "your Nnamdi Kanu" is not in court. Justice Binta Nyako: "The issue at hand is that, I want my Nnamdi Kanu". I knew where he was and where he slept. He applied to be set free and these three men (sureties), agreed to vouch for him, that whenever he is needed, he will be provided. I am not interested in whatever you are saying, just bring him here. The bail bond must be forfeited and I am going to allot time for the payment". Barrister Umeh: "My lord, it will be illegal that such a decision should be made without hearing from the sureties. Our process is backed by the law. I am requesting most earnestly, that this honorable court make it comfortably possible to hear from the them. Let the court hear factors and issues surrounding the reasons why the defendant is not in court. Busy bodies disturbed what was undisturbed. The defendant was readily prepared to attend court matters until the unnecessary interruption set in. Your lordship, there is a process filed by the sureties and not the defendant which has not been heard. It will be unfair if you rule on bail bond forfeiture without firstly, hearing from the sureties". Justice Binta Nyako: "Barrister Umeh, I have taken my decision. The court hereby orders that the sureties shall in the interim, deposit the bail bond in two months. One hundred million naira (N100,000,000) is not small. I will give you two months for it's provision. After the forfeiture, I shall give you six more months to provide Nnamdi Kanu. I gave him to you and you threw him away". "I want us to ginger this case and after, we now swagger". Barrister Umeh: "Your lordship, you need to hear from the sureties before taking your decision. We are ready to ginger the swagger my lord, but where do you get one hundred million naira (N100,000,000) in two months? It will then be that you are contravening the law which is not healthy". Justice Binta Nyako: "Have you heard about shifting the goal post? Manchester United and Chelsea?" Barrister Umeh: "My lord, I am not comfortable with your ruling". Justice Binta Nyako: "Barrister Umeh, I do not like your voice". The case was then adjourned to the 28th of March 2019, for further hearing.